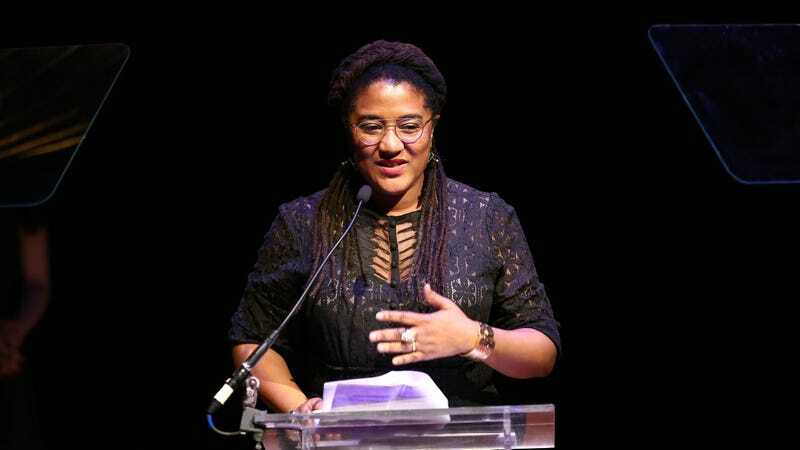 Lynn Nottage speaks on stage during 32nd Annual Lucille Lortel Awards at NYU Skirball Center on May 7, 2017 in New York City. With the endless amount of political rhetoric currently in our orbit, it’s often easy to forget about the people behind it—not just the politicians themselves, but the countless people whose fears make their power possible. It’s the grim reality we faced in 2016 when fear became the battle cry fueling the ascendancy to the presidency. For playwright Lynn Nottage, there was the recognition of long-held frustrations coming to nationwide fruition. Just a few years before, she’d seen that fear up close as she interviewed members of the declining working and middle class in Redding, Pa., where she spent two-and-a-half years researching what would become her 2017 Pulitzer Prize-winning play, Sweat. Now in production at Chicago’s Goodman Theatre under the direction of veteran actor-director Ron O.J. Parson, Sweat centers the voices of those most affected by the decline of American-based big industry, the workers themselves. And with intimate insight, Nottage taps into the desperation that drives division, even in the midst of common suffering. Nottage is keenly aware of how shifting circumstances and demographics affect collective consciousness. For the past 20 years, the playwright and her family have lived in her childhood home in Brooklyn, N.Y., in an increasingly affluent neighborhood which itself tells the story of how the disenfranchised are frequently displaced. As gentrification reaches more and more urban areas, it’s not an uncommon story, but one that provides greater context on Nottage’s perspective. A former national press secretary for Amnesty International and the daughter of an activist and feminist mother who “never saw a picket line she didn’t want to stand on,” Nottage’s work is deeply informed by issues of social justice, whether it be the plight of factory workers unceremoniously shut out from much-needed jobs or advocating for working playwright parents like herself, struggling to find the space they need to create. Now one of the most prominent playwrights of her (or any) generation—having won the first of her two Pulitzers in 2009 for Ruined—Nottage is fully aware of what her presence as a woman of color means in that space. In particular, she recognizes the inherent expectation of black playwrights to speak on issues of race and culture. Leaning into harder issues is a legacy that Nottage traces back to the abolitionist theater, as the dramatized stories of escaped slaves like Frederick Douglass, William and Ellen Craft, William Wells Brown and Henry “Box” Brown became vehicles for spreading the word about social ills to entertainment-loving audiences. Our unique history in America informs much of Nottage’s work as well. Her award-winning play Intimate Apparel tells the story of a black seamstress at the turn of the last century and is now being refashioned as an opera. Similarly, she is now expanding the range of her medium, collaborating on a musical adaptation of the bestselling novel and subsequent historical film, The Secret Life of Bees. Nottage says it was “the collision of many moments” that pushed her toward the medium of playwriting. And after years of rising through the theatrical ranks without much in the way of mentorship from other black women writers, Nottage tells us that what thrills her now is the rising chorus of black women now creating a diverse landscape of stories to add to her own. Sweat is in production at Chicago’s Goodman Theatre through April 14. Tickets are available on their website.